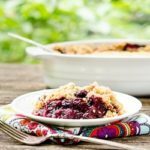 This mixed berry crisp is made with an assortment of fresh berries and has a crumbly, crisp topping. It's a summery dessert to make for family and friends. Preheat oven to 350°F. Lightly butter a 2-quart baking dish. Gently stir together berries, sugar, flour, cinnamon, and lemon juice in a large bowl. Place berry mixture in baking dish and spread out evenly. Whisk together oats, flour, brown sugar, granulated sugar, cinnamon, and salt. Use a pastry blender to cut butter into mixture until it resembles a coarse meal. Sprinkle topping over berries. Note this will make a thick crisp topping. Use less if desired and save any remaining to use for another purpose (keep chilled or freeze). Place baking dish on a baking sheet. Bake until fruit is bubbling and topping is golden brown, about 1 hour. Cool crisp slightly (about 15 minutes) prior to serving.